A view of the skies over the European Southern Observatory's La Silla Observatory in Chile. 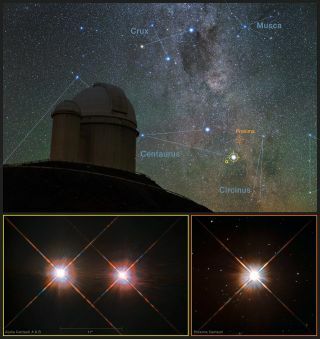 The bottom right image shows Proxima Centauri — the closest star to the solar system, orbited by the planet Proxima b — while the bottom left image shows the pairs of stars called Alpha Centauri A and B. An Earth-like alien planet orbiting a star known as Proxima Centauri — Earth's closest stellar neighbor — has been identified by astronomers from the European Southern Observatory (ESO). The newfound exoplanet, aptly named Proxima b, lies within the habitable zone of Proxima Centauri and is believed to have a suitable surface temperature that would allow for the presence of liquid water. This means that this rocky, Earth-like world has the potential to support life. 4.85 billion: The age of Proxima Centauri. For reference, the sun is 4.6 billion years old — that's old. 7 million: The distance, in kilometers, at which Proxima b orbits its star Proxima Centauri. Even though Proxima b orbits much closer to its star than Earth orbits the sun, Proxima Centauri is a red dwarf, which means it is smaller and cooler than the sun. However, it is still likely that Proxima b is impacted by any solar flares from Proxima Centauri. 4.37 light-years: The distance the Alpha Centauri binary star system is from the sun. By itself, Alpha Centauri A is the fourth brightest star in the sky. 4.22 light-years: The distance Proxima Centauri lies from Earth's sun. Proxima Centauri lies within the constellation of Centaurus, which includes the Alpha Centauri star system. At just over 4 light-years from Earth, Proxima Centaur is the closest stellar neighbor to our sun. 165,000: The approximate number of years it would take to reach the Alpha Centauri star system via the space shuttle. Since the Alpha Centaur system is about 4.33 light-years from Earth, the trip to Proxima b would be slightly shorter. 3,200: The approximate number of confirmed alien planets scientists have discovered since 1992, when the first planets outside our solar system were identified. NASA's Kepler space telescope has played a major role in many of these discoveries. 86: The temperature in degrees Fahrenheit Proxima b's surface could reach if researchers can confirm it has an atmosphere. If the planet lacks an atmosphere, surface temperatures may be as low as minus 40 degrees Fahrenheit (minus 40 degrees Celsius). If the planet has an insulating atmosphere, then that would allow for temperatures to reach 86 F (30 C), which would be warm enough to host liquid water on its surface, according to yesterday's (Aug. 23) Nature news briefing. 11.2: The number of Earth days it takes for Proxima b to complete a single orbit around its parent star, Proxima Centauri. 3: The number of stars in the Alpha Centauri system. In addition to Proxima Centauri, there's Alpha Centauri A and B, which form a binary pair. 1.3: The mass of exoplanet Proxima b as compared with Earth. The newfound planet is very similar to Earth in size, but just a little bigger. 0.24 light-years: The distance Proxima Centauri lies from Alpha Centauri A and Alpha Centauri B. At this distance from each other, some astronomers question whether Proxima Centauri should even be considered part of the same star system.